Battle of the Little Bighorn? Not much of a battle, really. This phreaking phantastic photo phootage of a big tom cougar taking down a young bighorn sheep on the shores of Lake Roosevelt in northeast Washington is astounding . Big cats are cool, but this sure shows why re-introducing bighorns successfully is nearly impossible in cougar country. You can bet this lion "parked" on this herd of sheep and tagged behind them, killing probably one a week until they were all gone. He probably perfected this technique of waiting until they have to go down to drink at some point, and are pretty much defenseless from a downhill charge. The photos were shot from a boat by fishermen in broad daylight, and arrived in an email from a friend of my father — I'm not sure who shot them. 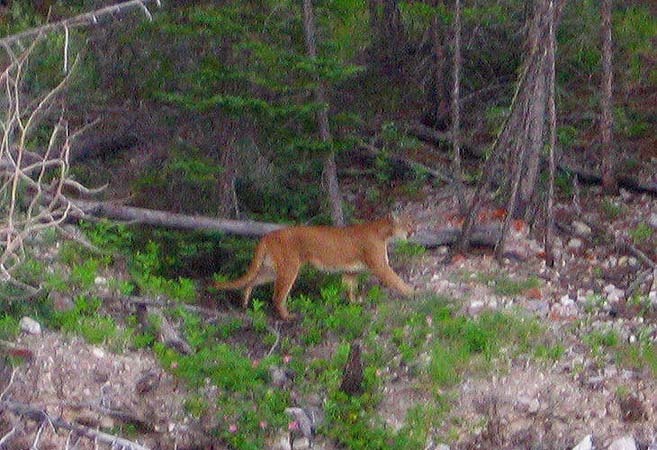 Generally, if you see nocturnal cougars during the day it's an indication they are somewhat overpopulated, much like seeing rabbits, rats, and raccoons or bartenders, djs, and burned-out sportswriters during daylight hours. Scary animals! Think about that next time you're casting for walleye along a rural lakeshore, listening peacefully to Deep Purple on your Sony Walkman. Feel the hair standing up on your neck? This time it just might be the Bad Nature on the hill behind you, not because you forgot to shave your neck down before going out. Living in Washington growing up, watching your back trail as you passed through the dark timber patches or while walking out at twilight was just part of life. There are so many big bad kitties in that state it was fairly common to see them in broad daylight even without hound hunting. 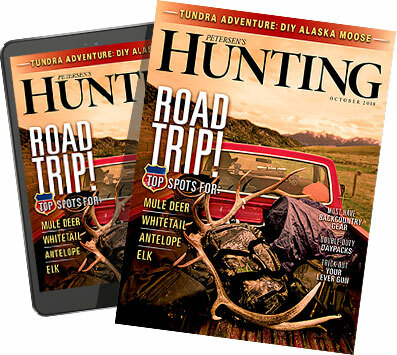 One reader of the mag I was editor of at the time killed three nuisance cougars in his yard after state agents failed to help despite multiple calls to wildlife officials (in their defense, they deal with an absolute ton of complaints in the Northwest). One cougar ran up right beside the man's kids while they were playing basketball and killed the family's goat and hauled it up a tree and started eating it in front of the children! Maybe it was a Greek cougar that had a taste for that goat, or that big cat's interpretation of basketball. Scary just the same. When another lion followed his wife from the house to her car, my dear reader went ahead and opened season. During a journalism internship I had as a rookie reporter in rural NE Washington at age 21, a cougar systematically annihilated every pet dog in the entire rural lake community I was living at. One night we all heard a loud 'pow' and the next day learned a man I knew had killed the maurauding poodle-poaching lion as it tried to drag his pit bull (dead, very dead) off the chain within .308-range of the guy's mobile home, whereupon he raised the window and let 'er rip, in classic rural redneck style, like a whitetail "hunter" on the outskirts of Missoula or Spokane. I still wonder if it was a bait setup. He never did like that dog. Collateral damage: his gold fish died in their tank from the concussion of the rifle report inside the house. The cougar was only a juvie, maybe 80 pounds, but killed that big dog like it was a fawn. The Pacific Northwest is so overrun with cats, my parents cut tracks from seven lions in one days' hunting along the Sol Duc River drainage on the Olympic Peninsula in the late '80s. Even back when hound hunting was legal, cats were still so numerous they both shot cougars that same day. And of course, there's that trail cam photo from a friend of a friend that went viral two months (the photo went viral, not to be confused with my friend's viruses) ago of NINE cougars in one nighttime pic on a cow the cats had killed in north central Washington. As for me, I feel like I've been tapped on the shoulder by lions on several occasions. One lion walked within 3 feet of me while I snoozed under a tree (as is my custom, I wonder why I never take home anything) while bowhunting for mule deer along the Wasatch Front in Utah. The snow was deep, and the cat's tracks damn near crossed my legs, as I waited above a pounded out mule deer trail. I woke up, saw the tracks, and peed myself a little. These photos definitely gave me a case of the yikes. It's pretty neat that a grand and regal game animal like the cougar has bounced back from the days of bounty hunting so splendidly&apos;¦I just wish sometimes they'd not bounced SO FAR back.